NETWORK FINALS: EMPIRE, THE GOLDBERGS and SURVIVOR gained 0.1 in final numbers, while DESIGNATED SURVIVOR and LIFE SENTENCE lost the same. CABLE HIGHLIGHTS: ESPN’s NBA doubleheader topped Wednesday cable at 0.52/0.50. On Bravo, the season premiere of REAL HOUSEWIVES OF NYC was at 0.46. On Discovery, STREET OUTLAWS fell 0.06 to 0.45 after a lead-in special at 0.41, and TWIN TURBOS was up 0.02 to 0.28. On TLC, MY 600-LB LIFE grew by 0.04 to 0.44, and SKIN TIGHT was steady at 0.26. On VH1, BLACK INK CREW dropped 0.09 to 0.44, and BEAUTY BAR was up 0.05 to 0.29. The season premiere of Food Network’s IRON CHEF GAUNTLET was at 0.34. MSNBC’s Top 10 RACHEL MADDOW SHOW led cable news in the demo at 0.33/0.48/2.8M, over Fox News’s HANNITY at 0.23/0.45/2.9M, and CNN’s ERIN BURNETT UPFRONT at 0.25/0.20/900K. On ID, MURDER CHOSE ME arrived at 0.32, and SEE NO EVIL ticked down to 0.32. Univision’s CONCACAF soccer match was at 0.31. 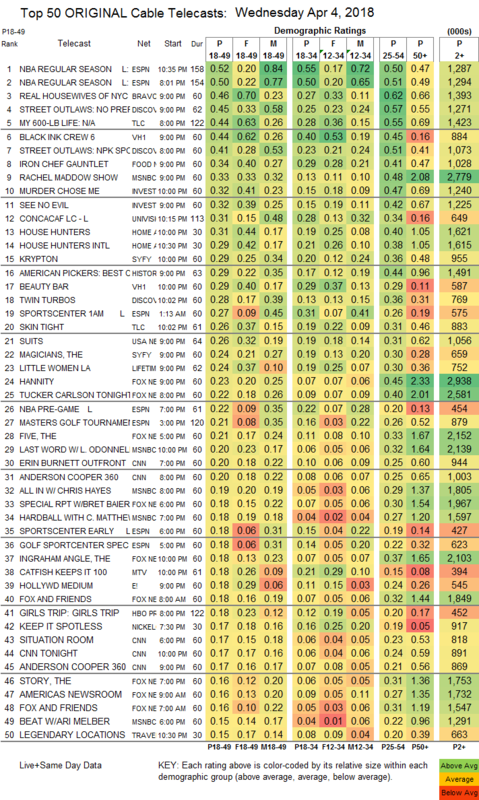 On HGTV, HOUSE HUNTERS edged up 0.02 to 0.31, and HOUSE HUNTERS INTL shed 0.02 to 0.29. On Syfy, KRYPTON ticked down to 0.29, and the season finale of THE MAGICIANS was down 0.04 to 0.24. USA’s SUITS dropped 0.04 to 0.26. On Lifetime, LITTLE WOMEN: LA rose 0.04 to 0.24, and GLAM MASTERS ticked up to 0.12. On MTV, a CATFISH special was at 0.18. E!’s HOLLYWOOD MEDIUM rose 0.03 to 0.18. FX’s THE AMERICANS ticked up to 0.15. Freeform’s FAMOUS IN LOVE returned for its 2nd season in unexciting fashion at 0.12/0.08. 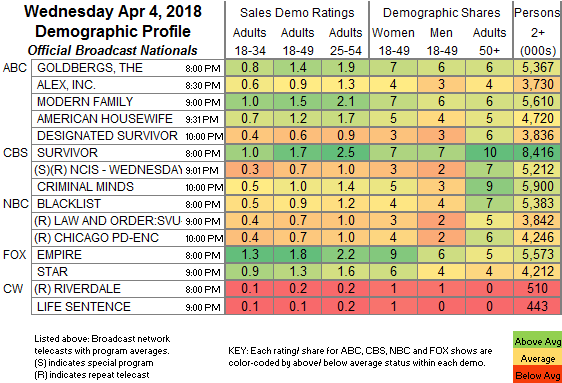 POP’s SCHITT’S CREEK lost a tick to 0.06. Sundance’s HAP & LEONARD rose 0.03 to 0.06.